You are currently browsing the Columbia Hearing Center blog archives for August, 2014. New research from Brigham and Women’s Hospital (BWH) in Boston, Mass, finds that higher caffeine intake is associated with lower rates of tinnitus in younger and middle-aged women. Tinnitus is often described as a ringing or buzzing sound in the ear when there is no outside source of the sounds. This research was published in the August issue of the American Journal of Medicine. In this prospective study, which followed more than 65,000 women, researchers tracked self-reported results regarding lifestyle and medical history from these women aged 30 to 44 years and without tinnitus in 1991. Information on self-reported tinnitus and date of onset was obtained from questionnaires returned in 2009, with cases defined as women who reported symptoms “a few days/week” or “daily.” After 18 years of follow up, researchers identified 5,289 cases of reported incident tinnitus. “We observed a significant inverse association between caffeine intake and the incidence of tinnitus among these women,” says Gary Curhan, MD, ScD, senior author of the paper and a physician-researcher in the Channing Division of Network Medicine at BWH and Professor of Medicine at Harvard Medical School. “The reason behind this observed association is unclear,” says Curhan. “We know that caffeine stimulates the central nervous system, and previous research has demonstrated that caffeine has a direct effect on the inner ear in both bench science and animal studies.” Researchers note that further evidence is needed to make any recommendations about whether the addition of caffeine would improve tinnitus symptoms. Earwax, a bodily emanation that many of us would rather do without, is actually pretty useful stuff — in small amounts. It’s a natural cleanser as it moves from inside the ear canal outward, gathering dead skin cells, hair, and dirt along the way. Tests have shown that it has antibacterial and antifungal properties. If your ears don’t have enough earwax, they’re likely to feel itchy and uncomfortable. And if you don’t have the right kind, you may be more likely to get ear infections. But for many people, earwax is manifestly too much of a good thing. An ear canal plugged up with earwax can cause earaches, infections, and other problems. And, not surprisingly, an excess of earwax can result in some loss of hearing. Guidelines from the American Academy of Otolaryngology–Head and Neck Surgery stress a let-it-be attitude toward earwax and warn against removal unless the earwax is causing a problem. Earwax starts as a mixture of fatty secretions from the sebaceous glands and sweat glands in the walls of the outer ear canal. Jaw movement from chewing or talking helps propel those secretions through the canal to the ear opening, where they dry up and harmlessly flake off. Earwax that picks up a lot of debris or sits in the ear canal for a long time can get hard and dry, so it’s more likely to cause a blockage. Conditions that produce a lot of dry, flaking skin, like eczema, can also result in hard earwax. And with age, the glandular secretions change consistency, so they don’t travel as easily through the ear canal. Hearing aids, which block the normal migration of earwax out of the ear, may also stimulate glands in the ear canal to produce more secretions. It is recommended that clinicians check patients with hearing aids for earwax buildup during any health care encounter. Content Provided by Harvard Medical and is found at this link. What a difference having hearing aids has made in my day to day life. It is much easier to share in conversations at the local restaurants. My questions are quickly answered at the Columbia Hearing Center. It’s a friendly, comfortable place to visit. I have needed hearing aids for several years and with the help of Columbia Hearing Center I am now able to afford them. I truly appreciate all their assistance and look forward to a long and health relationship. Thanks again so much! I will be able to do my job better and hear my daughter better too! They were willing to go that extra mile to help me! Thank you! I’ve been a farmer for many years of my life and because of operating machinery and being an avid hunter and enjoying shooting sports, I was suffering hearing loss. I tried some mail order aids but they weren’t satisfactory. I read an advertisement about Columbia Hearing Center that mentioned a certain hearing aid I was interested in. I called for an appointment and we stared the attempt to fit these new aids, but due to a unique sensuosity of my inner ear, as hard as we tried, we could not make them successful. Thanks to their determination and expert knowledge, Nathan and Jason recommended another style. After fitting and adjusting they fit very comfortably and I can hear better than I have for years. Thank you Nathan, Jason and Katie for your courteous, capable, and friendly expertise we have at Columbia Hearing Center. 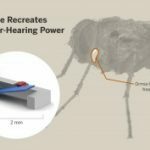 A team of researchers at the Cockrell School of Engineering at The University of Texas at Austin (UT Austin) has developed a tiny, low-power device that mimics a fly’s hearing mechanisms. The new device could be used to build the next generation of hypersensitive hearing aids with intelligent microphones that adaptively focus only on those conversations or sounds that are of interest to the wearer. Using the fly’s ear structure as a model, Neal Hall, PhD, an assistant professor in the Cockrell School’s department of electrical and computer engineering and his graduate students built a miniature pressure-sensitive device out of silicon that replicates the fly’s super-evolved hearing structure. 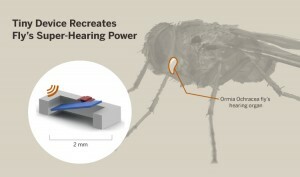 The 2mm wide device is nearly identical in size to the fly’s hearing organ. Humans and other mammals have the ability to pinpoint sound sources because of the time separation of sound between our ears. Insects generally lack this ability because their bodies are so small that sound waves essentially hit both sides simultaneously. O. ochracea is a notable exception. It can locate the direction of a cricket’s chirp even though its ears are less than 2mm apart. In the four millionths of a second between the sound entering one ear and the other, the sound phase shifts slightly. The teeter-totter-style structure in the fly’s ear effectively amplifies the time delay and allows the fly to locate its cricket prey with remarkable accuracy. For more information or to read the whole article click this link. If you are living with someone with hearing loss you probably have been told, and try to, speak very clearly. But have you ever had your loved one accuse you of shouting at them or sounding angry when you tried to speak clearly? Recent research at the University of Utah in Salt Lake City has found that speaking clearly can have negative connotations no matter what tone of voice or words you use. This study took 18 young adults with normal hearing and had them listen to sentences spoken by volunteers. The volunteers were told to read each sentence in two ways; a normal conversational way, and then with careful enunciation (clear speech). None of the sentences contained any negative words or phrases. Once read, the 18 listeners were asked to rate each sentence with an emotion; sad, angry, happy, fear, disgust or neutral. Most of the time, the listeners interpreted the sentences that were spoken with the clear speech to be more negative in nature than those spoken in normal conversational tones despite the fact that the sentences themselves were the exact same and neutral in nature. The listeners also thought that the speakers who had the most difference between their normal conversational tone and their clear speech were angry, unhappy people. This probably comes as no surprise to many of you as oftentimes when we are angry we tend to speak more slowly and precisely. With a bit of luck, bringing awareness to the challenges of communication when hearing loss is present might help to easy tension on both sides of the conversation. “The actual extent of hearing loss associated with prenatal smoke exposure in this study seems relatively modest; the largest difference in pure-tone hearing threshold between exposed and unexposed adolescents is less than 3 decibels, and most of the hearing loss is mild. However, an almost 3-fold increased odds of unilateral hearing loss in adolescents with prenatal smoke exposure is still worrisome,” the study concludes.